Like all of the festive season, New Year's Eve in Greece was a new experience for us, and we weren't quite sure what to expect. We decided to go down into town, grab a bite to eat, and see what happened. At first, to be honest, this seemed like it had been a terrible idea. At 8pm it was absolutely chucking it down without mercy, there was nobody around, and all the good restaurants were either closed, or booked out for group parties starting later in the evening. We had not planned ahead well. We ended up having dinner that was nice enough, but that was in an absolutely freezing eaterie right on the harbour we wouldn't normally have given time-of-day to for a beer, let alone purchase a full meal. After that we steeled ourselves again against the weather, and decided to go to the Avalon rock bar - but it seemed packed with U.S. Navy personnel from Souda, and so our bottle failed us. Instead we headed to old faithful Remezzo. As we walked in they dutifully informed us that they would be closing in half-hour. Which would see our night out ending at about 10pm. We left there, wandered aimlessly for a bit, and then Claire took the initiative, and bravely strode up the steps to The Point. We'd previously identified it as a hideous tourist meat-market dance club, but we'd decided that if we were ever going to visit it, then tonight was the night. How wrong we had been about it. 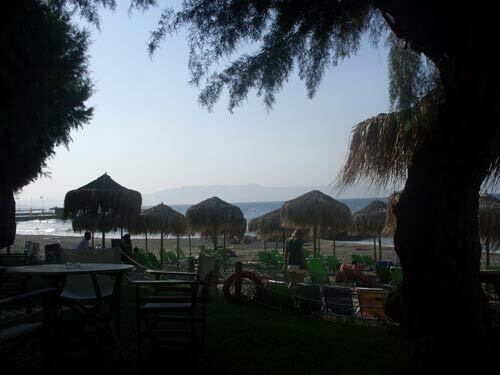 I'm sure it does get ghastly in summer, but we arrived to find it playing New Order, The Killers and Depeche Mode, with lovely English-speaking bar staff who were all recent arrivals in Crete from Denmark, and we had a great, great time. There were free shots, we purchased an over-priced mini-champagne bottle for midnight, and we had a real laugh. From such a doomy start where we thought we might be in a cab home by 10:15pm we had a fantastic time. Still, we're nothing if not British and inexperienced at this clubbing abroad lark. We left town at 2am, exhausted and ready for bed. As we walked down Halidon, it was heaving with people dressed up to the nines - it seemed that Chania was getting ready to party hard for 2008 without us! We've found a lovely new late-night after dinner cafe to go to in town - the Synagogue Cafe. It isn't actually in the old Synagogue itself, but is next door to it in the backstreets behind the Konaki restaurant where we had our first ever meal out in Chania, and this year where I had my first beer boot of the season. Claire read about the cafe in one of the free guides that we pick up from time to time, so we thought we'd check it out after dinner the other week. It was amazing. It is inside the shell of an old Venetian building, taken up four old rooms. 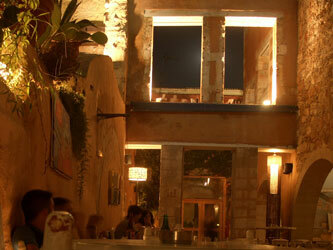 It has been beautifully lit, so that with the moonlight and the ambient lighting it is really cosy and friendly. 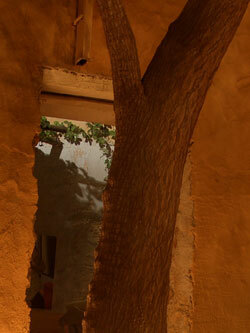 It is completely open to the elements, and there are even trees growing inside it. 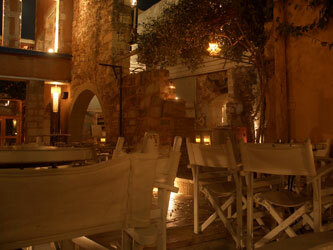 The play laid-back lounge music, and it has a really nice atmosphere. Being very British still, we typically turn up just as it opens, around 10pm, and leave just as the party is really getting going. Because it is difficult to find in the back-streets, the crowd are almost exclusively Greek. We love it - it is just a shame we found it so late in the season. We guess, as there don't seem to be any blinds or shutters in the building, that it must close for winter. 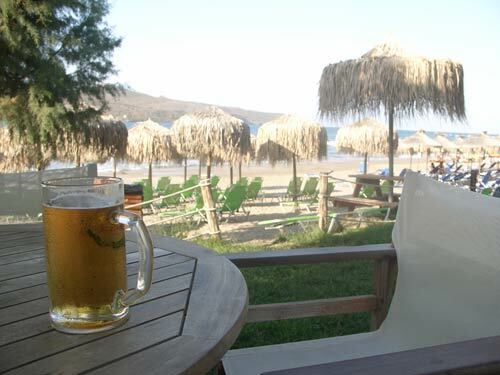 Mostly this year we've had guests arriving on Tuesday, which is changeover day in Chania. That means that all the charter flights arrive at once, the airport is in chaos, and we usually have some kind of water or electricity cut as every hotel and guesthouse in our neighbourhood frantically does their laundry and cleans the rooms. 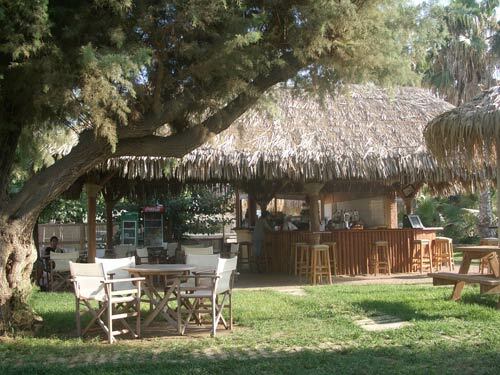 We usually start off by taking our guests to the Cretan evening at Golden Sands, the resort near us which offers ping-bong. 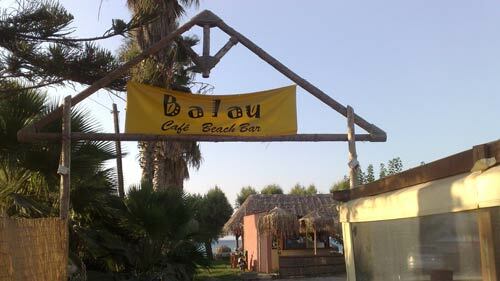 It is, of course, a shameless tourist trap, but it is good fun and an introduction to the culture of the island. Well, at least the packaged tourist version of it anyway. 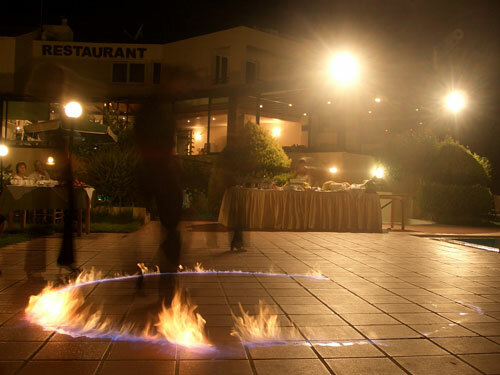 For €12 per head you get an all-you-can-eat braai, and entertainment in the form of a troupe of Cretan dancers. We've become quite adept at joining in with the obligatory Sirtaki from Zorba The Greek, and on the odd occasion it has been known for Claire & I to be up dancing on a table in the middle of a crowd. Fortunately, I haven't had to master the fire dance. A kebab for Christmas dinner?